Yanukovych and Medvedchuk have had 54 phone talks during the Maydan. 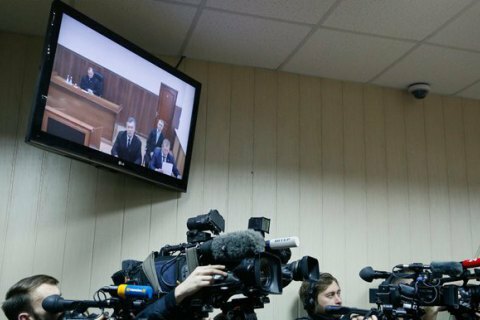 Ukrainian prosecutors during the questioning of the former President Viktor Yanukovych by video conference said Yanukovych on the morning of 20 February called Ukrainian politician and a friend of Putin, Viktor Medvedchuk, in Russia. "At least 54 phone contacts have been established between you and Medvedchuk in the period between December 2013 and February 2014," a representative of the prosecution told Yanukovych, who was in Rostov-on-Don, Russia on 28 November. The prosecutor described the visit to Russia of Mykola Azarov, who at the time was fired from his post as prime minister. "On 18 February 2014 at around 14:30, Azarov on a charter flight departed to St. Peterburg where he met, in particular, Russian President Putin," said the prosecutor in Kyiv’s Svyatoshynskyy district court.